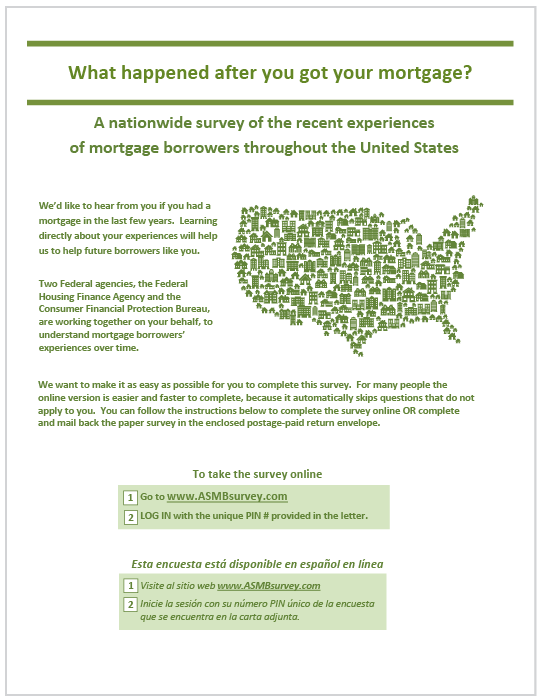 If you’re here, you probably got our letter asking for your help with an important survey of American consumers about their mortgage experiences. This survey is jointly sponsored by the Federal Housing Finance Agency (FHFA) and the Consumer Financial Protection Bureau (CFPB), two federal agencies that are working together to improve the safety and transparency of the lending process for all consumers. Learning directly from borrowers about their experiences can provide valuable insight about the mortgage market that will help us improve lenders’ and mortgage servicers’ practices and the mortgage process for future borrowers. To ensure that the survey provides a full picture, it is important that the survey reflects the experiences of all types of mortgage borrowers. Your participation will help us get a better understanding of mortgage borrowers’ experiences and views on, for example, making monthly payments, getting information from their lender or servicer, or refinancing a mortgage. Whether you kept the mortgage you had or you got a new mortgage or you refinanced the mortgage or whether the loan was for your home or for another property, we want to hear from you. The responses to this survey will remain confidential. The survey does not ask you for any identifying information, so please do not identify yourself in any way on the envelope or the returned questionnaire. The code numbers on the survey are used only to keep track of returned surveys and to aid in the scanning process.